What has changed compared to the last version? Are there new requirements that did not previously exist? Can some things be omitted in the future? In this pdf download these and other frequently asked questions are answered while giving a compact overview of the contents of the completely revised chapter. 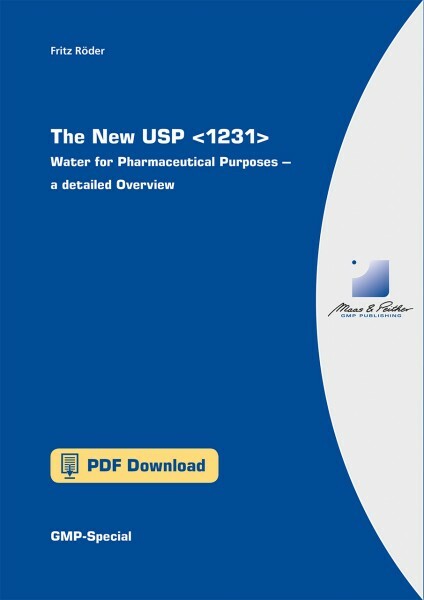 The new version of USP 1231 is very comprehensive and contains many concise instructions for the operation of water-systems. What has changed compared to the last version? Are there new requirements that did not previously exist? Can some things be omitted in the future? Our author Fritz Röder takes a look at these questions while giving a compact overview of the contents of the completely revised chapter. Short overview – What is USP<1231> and what is new? Note: For copyright reasons the original text of USP <1231> is not included in this document. Leseprobe "GMP Compliance Index 2017"
You will receive an email with the download information immediately after the credit card payment.